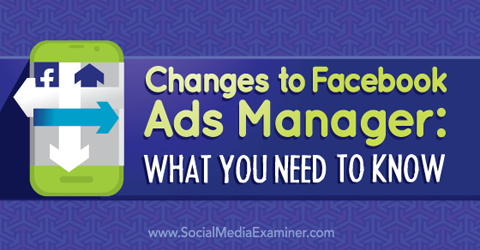 Have you noticed recent changes to Facebook Ads Manager? While Facebook regularly updates the Ads Manager, most of the recent changes affect navigation rather than function. In this article you’ll discover the latest changes to Facebook Ads Manager and how to navigate them. Let’s start with a quick review of Facebook ads. There are three levels: Campaigns, Ad Sets and Ads. Each one has different functionality. 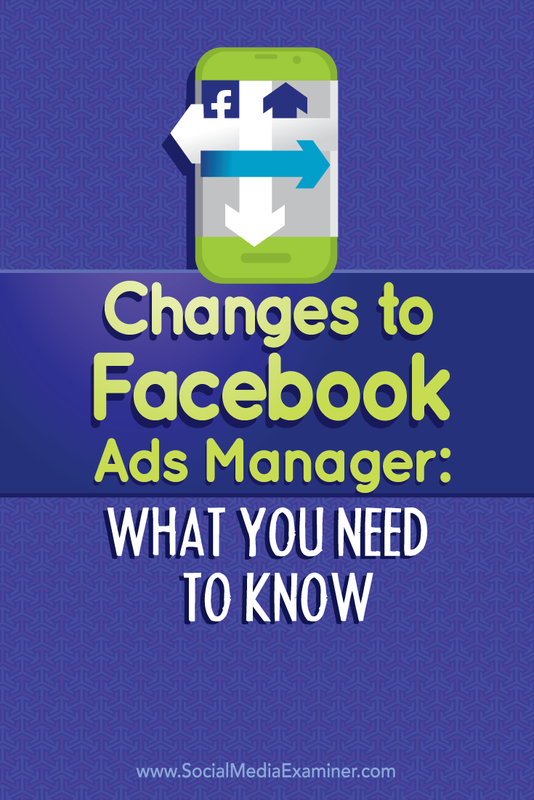 Discover what marketers need to know about the latest changes to Facebook Ads Manager. The Campaign level is where you set your true objective, such as sending people to your website, promoting your Facebook page, having people claim a Facebook offer and more. The Ad Set is where you determine the budgeting, targeting and schedule for your ads. The Ad level is where you change the images and text. The primary changes to the Ads Manager area are cosmetic, and the most notable is the way to run reports. Below is a quick list of the main changes. The main navigation moved from the left sidebar to the top of the page. Facebook Saved Reports are now right under the top menu, indicated by a “spreadsheet” symbol. The statistics of your campaign are more accessible in the Campaigns, Ad Sets and Ads. To create any new reports, drill down into the level you want to see (Ad Sets, Ads, etc. ), then modify the columns you are viewing. Change Ad Accounts from a drop-down menu under the main navigation at the top. A bar graph shows the previous 7 days of ad spend, rather than the text listing. 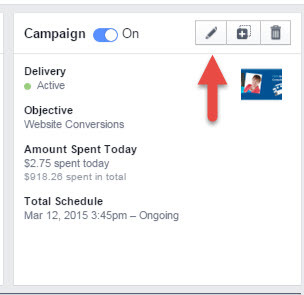 Change the view of what level you see (Campaign, Ad Set or Ad) from the drop-down menu under the spend area. Also set the default view of the columns you see. An Image Library is now available under the Tools section. Audiences, Audience Insights and Conversion Tracking are under the Tools drop-down menu. Campaign, Ad Set and Ad viewing is a bit different. The edit feature and preview appear on the right side for the Ads and Ad Sets. New graphs show different delivery information when you dive into the Campaigns. Filter and search slightly differently, using the Filter button on the upper right. 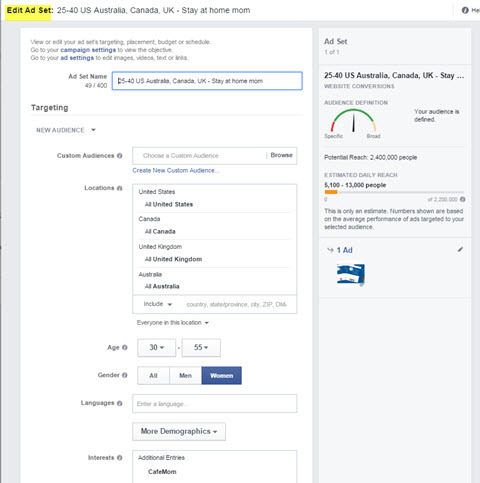 These are the major places where there are changes with Facebook ads, along with greater detail. For navigation, you can now find the choices that used to be on the left sidebar at the top. You’ll also see some of the options show up under the Tools drop-down menu. Navigate to different areas of the Ads Manager from the top menu bar. Right below the main navigation, access previously saved reports, using the icon that looks like a spreadsheet. For those who are admins of multiple Facebook ads accounts, the Switch Accounts drop-down is right next to it. 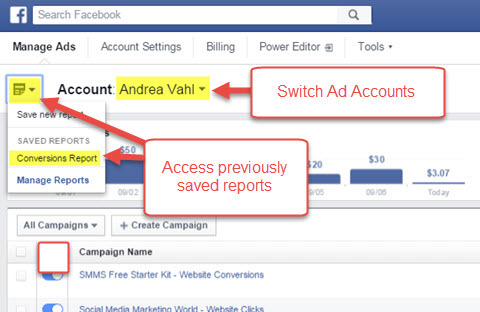 Access previously saved ad reports or switch ad accounts. Below the saved reports is the new visual representation of your daily ad spend from the previous 7 days. The visual representation allows you to quickly see how much you are spending each day. 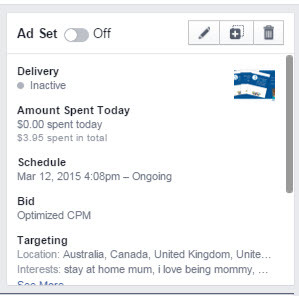 Below the Ad Spend area are your Campaigns by default. However, you can switch your view to the Ad Set or Ad View from the drop-down menu. Switch to see your ad sets or ads. One of the biggest changes is the way you view what is happening with each ad or ad set in terms of costs, clicks, click-through rate, etc. The reports are more incorporated into the main viewing area at each level: Campaign, Ad Set, and Ad. Customize the columns you see to get the data you want to view. 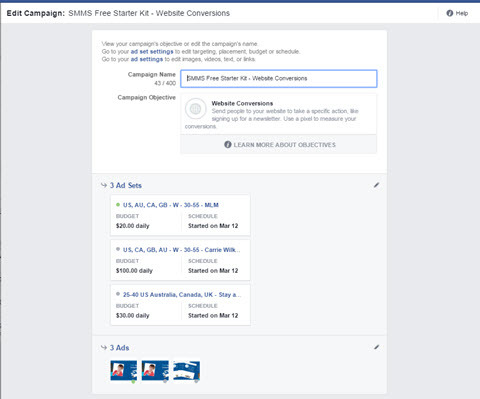 From the Ads Manager main menu, click on an individual campaign name to drill down into the ad sets and ads that are below that individual campaign. Once you get into the campaigns and ad set, mouse over certain spots in the graph or customize the columns you view to get more information about the results. 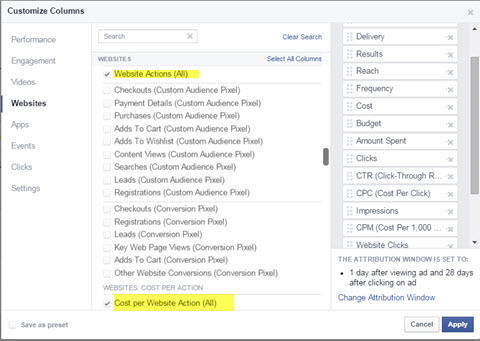 Dive into your ad sets and ad results by customizing the columns you see. 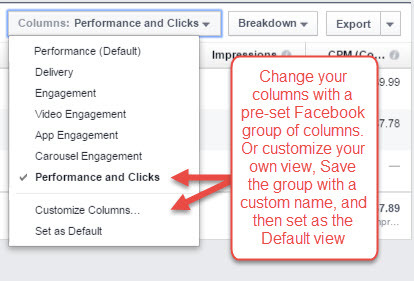 Facebook’s default view is the Performance level, but you can set whatever default group you want to view from the drop-down menu. Also customize the columns and set whatever group of columns as the default view for your account. 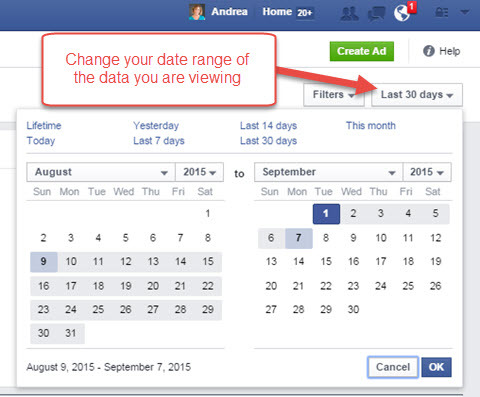 Customize the data you see in your Facebook ad reporting area. To customize your column view, first select Customize Columns. Then select the columns you want in your default view (for example, if I have an ad with a conversion pixel, I add Website Actions and Cost of Website Actions). Add a column with Website Actions if you run ads with conversion pixels. Give your column preset a custom name. Now set the new column preset view as the default going forward. Set the new column preset as the default view. 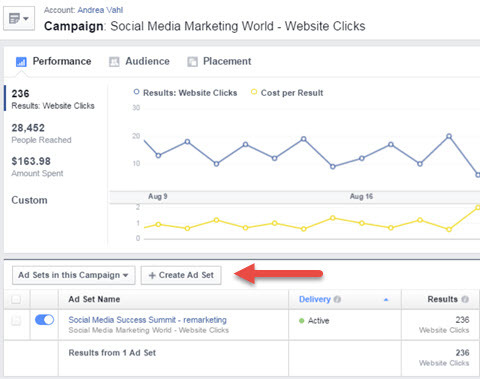 In the new Facebook Ads Manager, how you review or edit any of your campaigns, ad sets and ads is done a little bit differently. Click the pencil icon at any level to edit or review settings. Do bulk edits under one campaign. Bulk edit ad sets under one campaign. Remember that to change different aspects of the campaign, you need to access the right level. 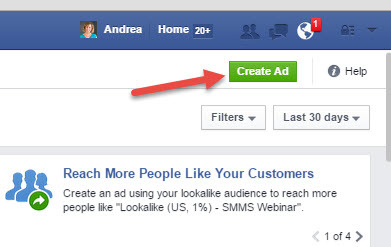 For example, to change the targeting of the ad, go to the Ad Set level. Navigate to the correct level of the campaign to view the targeting or ad. Then make the necessary edits to targeting. Edit targeting demographics at the Ad Set level. To change the image or text of the ad, go to the ad itself. Use the eye icon to preview the ad and the pencil icon to edit the ad. Keep clicking on the blue links in the reports to dive down further in the campaign to see the preview of the ad or make any changes. The Tools drop-down menu has the Audiences (also known as Custom Audiences), Audience Insights, Conversion Tracking, Pages, the new Image Library, an App Ads Helper and access to Advertiser Support. Many people don’t realize that you can create and access all of your custom audiences (email uploads, website retargeting audiences and lookalike audiences) right from the Ads Manager. You don’t need to use Power Editor to access and create these audiences. The Audiences (Custom Audiences) tool is still available in the Ads Manager. 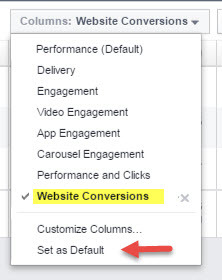 Conversion Tracking helps you set up custom pixels to track particular actions on your website (email opt-ins, sales and traffic for retargeting). This will be changing to a single pixel system in the future, which is currently rolling out. Conversion Tracking is changing, but is still accessible from the Ads Manager. The Image Library holds all of the ads you have uploaded. You can easily add new images to the Image Library to use later by clicking Upload Images. 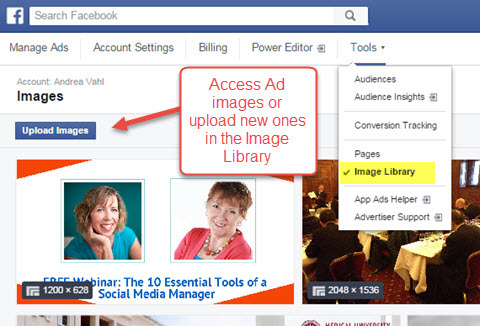 Access ad images or upload new ones in the Image Library. The Facebook ad creation process is essentially the same. To create an ad, click the green button in the upper-right corner of the Ads Manager. Create a Facebook ad from the Ads Manager. If you click Create Ad Set or Create Ad underneath any of the campaigns or ad sets you have navigated to in the Ads Manager, you will create ads underneath that preset campaign or ad set. Easily create a new ad set or ad within one of your already-created campaigns or ad sets. 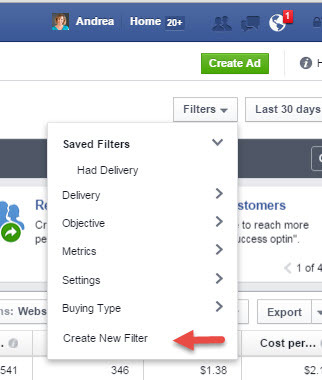 To search for a particular campaign or to filter the campaigns to see the more recent ones, use the Filter option. 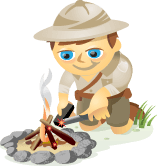 Search your ad campaigns with filters. Select Create New Filter to find a campaign by name. Search by campaign name or other information. As Facebook continues to evolve, platform changes are inevitable. I think some of the latest changes to the Facebook Ads Manager, such as being able to set the columns to what you want to see, definitely improve the experience. Keep an eye out. More changes are in store. What do you think? Have you been using Facebook ads? What have been your results? How do you feel about the changes? Share your thoughts in the comments below. 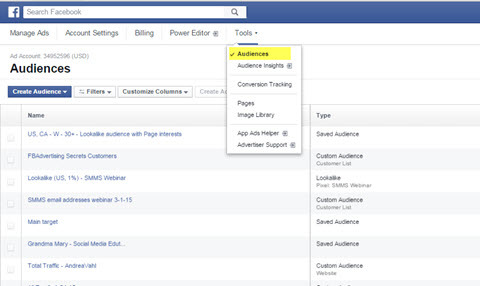 What marketers need to know about recent changes to Facebook Ads Manager.